Cheap Flights From Calgary (YYC) to Ottawa (YOW). Find cheap tickets from Calgary to Ottawa. Cheapest Flights from Calgary to Ottawa. Nanak Flights offers cheapest flights from Calgary to Ottawa. Our Proprietary Flights booking engine searches cheap tickets from Calgary to Ottawa and displays up to 200 cheapest flights options to the customers. Most popular airlines for Calgary to Ottawa route are Air Canada, Westjet, Air Canada and Westjet Combination tickets. We sell all Air Canada Tango, Flex, Lattitude, Business class lowest and Business class flexible fare families for Calgary to Ottawa fares. We offer combination of different fare families on Air Canada flights. Our system also combines Air Canada and Westjet fares for Calgary to Ottawa route. These special tickets from Calgary to Ottawa are called Split tickets and each airline's change and cancellation rules apply. Most of the tickets in domestic market are non refundable tickets. You might get Future travel credit with $100 change fee. Please call us to find out about the cancellation rules. cheap tickets from Calgary to Ottawa are changeable with Penalty of $100 plus fare difference. Do you know that earliest flight from Calgary to Ottawa on Air Canada departs at 05:45 am in the morning and on West jet departs at 07:00 am in the morning. Do you know that last flight from Calgary to Ottawa on Air Canada departs at 7:30 pm in the evening and on West jet departs at 8:00 pm in the evening. More information about Ottawa can be found at Ottawa information. Do you know how much are the average tickets prices from Calgary to Ottawa Flights? 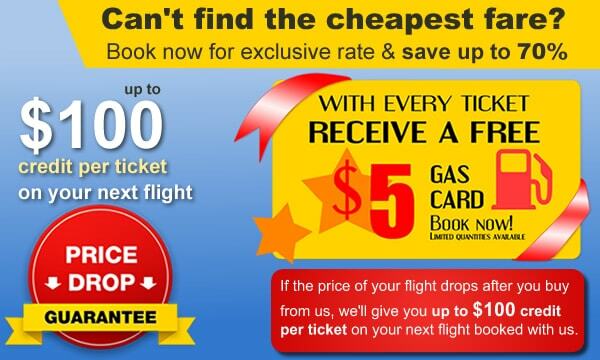 $5 Gas Card Offer for all cheap Flights booked from Calgary to Ottawa. Cheap tickets from Calgary to Ottawa flights. Up to $100 credit per ticket with Price Drop guarantee for Calgary to Ottawa flights. Over 50 travel experts to help you. Top 7 secret tips and tricks from experts to help you save big. Please refer to following top 7 secret tips to save big. Book your trip in advance. Sooner you book, you will save big money. Plan flying during weekdays to save weekend surcharge. Weekend surcharge may apply if you are travelling during Friday, Saturday or Sunday. Plan your trip during Airline's low season. Seasonality is the major factor which determines the ticket prices. March, June, July, August and December are the high season. Price will be higher during high season. Plan your vacation during Jan, Feb, April, May, September, October, November to save big. These months are low seasons or shoulder seasons. Check if you can drive to a nearby non busy or small Airport even if you have to drive 100 Km in your car. Airline load factors are always high from Busy airports. The lower Airline inventory is available at nearby non-busy Airports. This secret will save you up to $200-300. Some airfare have minimum stay requirements of 3 nights or 7 nights at the destination. Check if your dates are flexible by 1 or 2 days and it can save you few hundred dollars. Read more. Watch our youtube video to learn about tips to save money for your dream vacations. Hotels: Browse our selection of hotels to find the lowest hotels deal. Book your Hotel room in advance. Sooner you book, you will save big money on Hotels. Compare Hotel rates with hotels close to Airports versus Airports 4-5 Km away from Airport. It will save you big bucks. Compare Hotel rates with star rating. Car Deals: NanakFlights offers great car rental rates. Book your car rental in advance. Sooner you book, you will save big money on Cars. Try to book car rental during weekday to save money. Check your needs for car rental. if you can rent a Sedan versus SUV, you can save big bucks. Vacation Packages: NanakFlights offers customized Vacation Packages. All Packages include Air, Hotels and Land tours. We specialize in customized vacation packages for Canada, USA, Cuba, Mexico, Dominican Republic, Las Vegas, Jamaica, Europe, India, Africa, Pakistan (Hajj & Umrah), Dubai and Middle east. Please call us to find out more about our customized vacation packages. Our most popular packages are Golden Triangle Tour, Kerala back waters, South India Tour, Dubai Tour, South Africa, The Wonders of Chile & Argentina, Kenya Safari Special, Sensational Sri Lanka Tours. Travel Insurance: NanakFlights recommends buying Travel insurance. Insurance protects you in case of unexpected medical emergencies and you will get full refund in case of medical emergency. We sell Super Visa Insurance. We recommend buying insurance on the same day. Please call us to find out about insurance quote and Super Visa Insurance quote. Gas card Rewards: NanakFlights will offer $5 gas card for all bookings purchased via Web site or through Phone. Please refer to terms on how to claim gas cards. Double Gas card Rewards to Canada and USA: NanakFlights will offer $10 gas card for Domestic and USA trip via Web site or through Phone. Please refer to terms on how to claim gas cards. Domestic trip include cities from Toronto, Vancouver, Calgary, Edmonton, Ottawa, Montreal, Halifax, Victoria, Fort McMurray, Winnipeg, Kelowna, Saskatoon and vice versa. NanakFlights is a Canadian owned and operated travel agency based in Brampton, Ontario. We speak English, Hindi, Punjabi,Telugu,Tamil and Bengali by phone. Please see our contact page for office hours. Halifax, Winnipeg, Vancouver, Calgary, Victoria, Montreal, ottawa, Halifax and all cities in Canada. We also sell Super Visa Insurance for your family members. Please call us to get quote on Super visa insurance. NanakFlights is TICO and IATA certified. Our TICO License Number is 50020679. TICO protects your trip. Book with confidence as you are TICO protected. Flash news: special $25 cash back on all PIA(PK) bookings to Pakistan. Get $10 gas card on all bookings to Dubai(DXB). © 2016 NanakFlights Canada. All Rights Reserved.